I usually don't make many double page layouts and I must admit, I didn't initially intend to with this one either. However, I couldn't get both photos arranged in a way that I liked and ended up splitting this into two pages. Sometimes when making two page layouts, I will complete one page at a time, but this time I worked on both siultaneously. I started with some kraft colored card stock from the Affinity stack by Paper Studio. I used some animal print paper from the Tattered and Worn stack and then used paper doilies and tags made with an Uchida tag punch. I love this punch and feel like I use it on almost every layout! 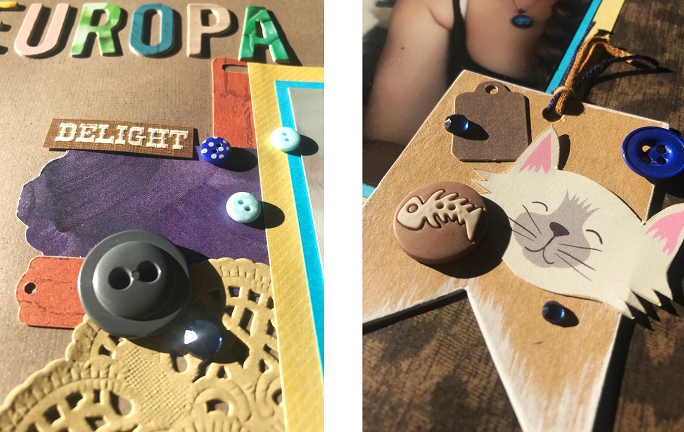 I embellished with wood buttons by Shimelle, some cat-themed die cuts by Photo Play and a sticker from Paper Studio's Cat Sayings sheet. I spelled out the names of my kitties with some American Crafts Chipboard stickers. This page was done for ARTastic Challenge's March challenge which featured this illustration by Luka Va. 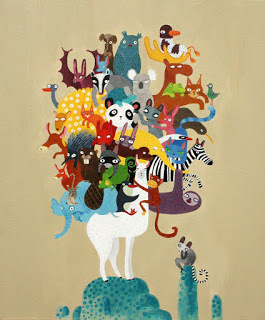 The challenge was simply "animals" and left it open to interpretation. I used the picture as inspiration for the color palette and featured my two favorite animals on the layout!